We’ll be advertising on some sites today, so if you’re a new reader, be sure to comment! We like to know where you come from. Hi, new friends! You comment, I reply! Because I love you. HAH! He’ll have the smell of lollipop in his cape for days! He should consider himself lucky the thing didn’t get stuck on his cape. man i hate it when you do that now i will fell bad for that little kid all day. She would have felt even worse if he had accepted, because she wouldn’t have any left. Look at that guy, when he takes a bite, he takes a BITE. Man, Skarva just missed the perfect opportunity to steal candy from a baby! And he calls himself an evil overlord… I keep wondering what flavor lollipop that is. Strawberry-banana. And, he’d probably have taken it if it didn’t already have that kid’s spit all over it. She ruined its pretty pattern with her slobbery tongue. Blargh! How many different fonts do you HAVE?! A lot, and I get more as needed if a character comes along and nothing I already have seems to fit. Fonts are fantastic. I think it’s amazing all the different ways we can write letters and still be able to read rapidly, and what the form of those letters can suggest. Oh, and capes say “TUG!” all the time. Where IS Random? Or Rabid? (guess I’ll just call him A Person now). He needs to see that we finally updated the cast page! I want a bite! Me! Over here! Aaaawww… That is both so cute and so sad. Hmm… Given Lorelei’s presence and the fact that we’re being shown Skärva’s response to children, I hereby register my suspicion that this is laying the foundation for some character development for Skärva – in particular that he will at some stage warm up to them, likely at least in part through his relationship with Lorelei. 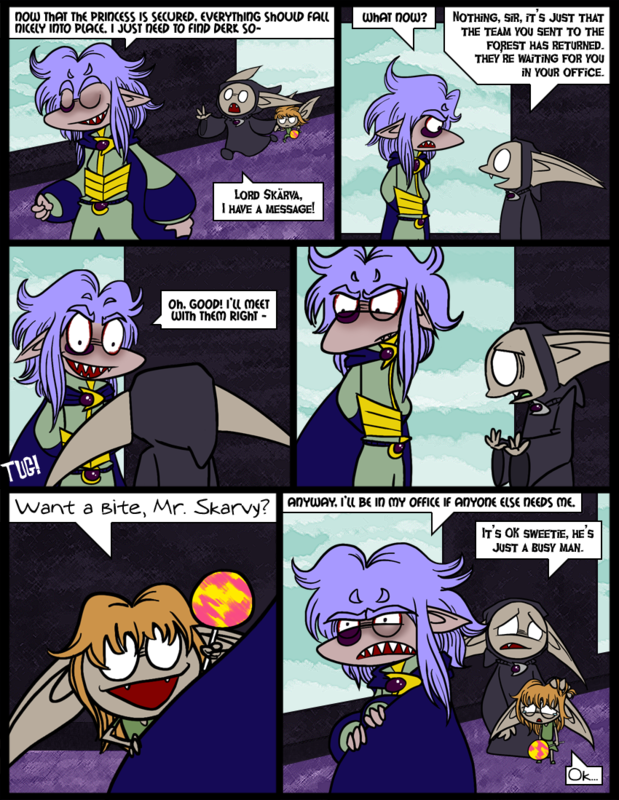 Ahaha love Skaerva’s face in that last panel, and the rather posessive way of clutching his cape. I feel rather mean; I find him most amusing when he’s annoyed. To the point where I’m liking things getting on his nerves just because I’ll get to see his funny faces. Gosh that hair is so poofy sometimes. Who’d have ever thought shark + man could = volumous hair. Reminds me of my ragdoll cat; long fluffy fur. I just wanna fluff it. And hear him complain. I love all the emotive long ears in this comic. And how you can get such baddies to look so adorable. That is the cutest little goblinish girl ever. Awww. Me and Victor are the mean ones. He keeps writing that Skärva gets annoyed and I keep loving to draw it. But people do seem to like that sort of schadenfreude. Hehe. What’s up with that? I like messing up Victor’s hair too, because it makes him mad. Skärva is my muse of sorts; since I knew I’d be drawing him more than anyone else, I endowed him with a lot of my favorite things to draw: sharp teeth, pointy face, eyebrows… more eyebrows… cape, and luxuriant hair. I never get tired of drawing that hair. Skarva needs a nap. Also his cape seems to expand and shrink when it wants to. Definitely; his red-rimmed eyes will only get worse and it’s gonna get scary! It’s… uh, stretchy? It’s a magical cape for a magical person? I’m not a professional artist? I didn’t know you two were buddies! We are! Kelly Nelly visited me the past weekend, so we were able to read The Fourth and comment together! She’s the one who introduced me to this comic. More than anything, “Skarvy” needs a nap! Hopefully he can take one after consulting with his minions, provided the kids running around the castle keep it down. would anyone think it odd that i think skarva is kinda cute? Oh, so you’re THE Rabid Person now. Did you see we updated the cast page? What will you bug us about now? How about more avatars? Or a fanart page. The first can be done. The second I mean to do someday when we have more fanart. We have some, but not really enough to merit a page quite yet, I’d say. I have some! but I don’t know how i would post it. Alright here are some others. Snowball: This snowball hit Skärva in the face, possibly of its own will. Its dedication to saying “plop” all the time has inspired many other objects to say things all the time. Skärva’s sling: An important cast member in the early comics, it was put out of a job by the appearance of Lorelei, forever and ever. Now it is antiquated and useless, begging for change on the side of the highway. THANKS, LORELEI. A response pertaining to AbscondWithAPie’s original question; I found the banner on Awkward Zombie, and thought it looked to be quite interesting! [My first impression turned out to hold true] This site was positively captured my attention! I shall be returning frequently for updates! Hoo-hoo! Thanks! I look forward to seeing you around! is it because she touched his cape? and their must be a story behind it him hating to be touched. Nah, not really. We might make one up in the future, but for now I think it’s enough that his cape is a status symbol and represents his dignity. He doesn’t want people he doesn’t care for getting their grubby hands all over it. He doesn’t know where those hands have been!